Trailers are an easy way to bring Sno Biz to an event or choose to keep in in a permanent location for the season. 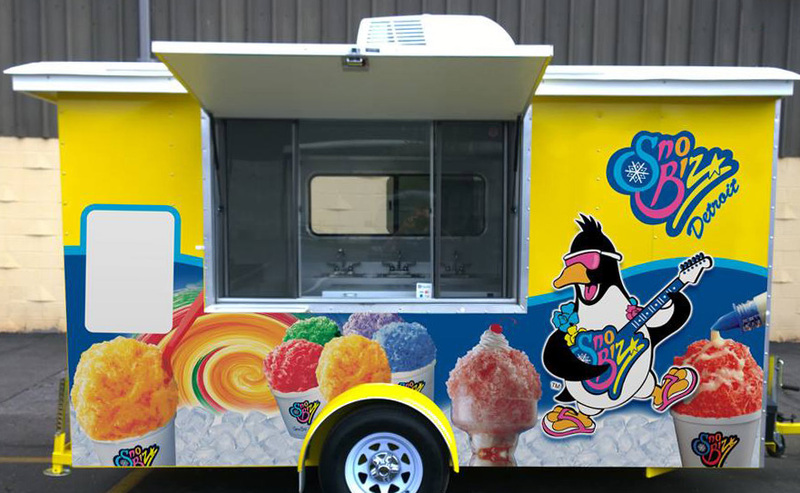 Built for selling Shave Ice, these trailers are constructed from ground up with quality in mind. Trailers come standard in colors Red, Light and Dark Blue, Yellow, Green and White. Wrapped (as shown) is extra. Concession Trailers picked up at a location other than the factory in Alabama will have a destination charge added! Terms: Deposit is $500.00 down, 10 % down for NSF or special orders, to place a concession trailer in production if we don’t have one to suit you in stock , balance due before shipping. All Deposits are NON-REFUNDABLE. Concession trailer deals must be completed and picked up within 30 days of your trailer being finished or deposit will be lost.